Local government is the framework which enables people to live harmoniously in urban and rural communities. Local government provides practical support through facilities and services and develops plans so that this support can be continued and improved to meet future needs and growth. How is local government different to other levels of government? Australia has three tiers of government – federal, state and local. Each level of government has its own responsibilities, although many of those responsibilities are shared. Local government is often seen as being the most accessible to the people. The Federal Government, (sometimes called the Commonwealth of Australia) is based in Canberra and its powers were enshrined in the Australian Constitution of 1901, the year the states became a federation. Federal Parliament comprises the House of Representatives or Lower House (elected representatives called Members of Parliament) and the Senate or Upper House (12 elected representatives from each State, 2 from each Territory). The Federal Government makes national laws and is responsible for defence and foreign affairs; trade, commerce and currency; immigration; postal services, telecommunications and broadcasting; air travel; most social services and pensions. The Federal Government is also involved, mainly through funding, in many things largely carried out by the States, such as health, education, environmental issues, industrial relations The Leader of the Federal Government is the Prime Minister. State government is the government which administers the State of New South Wales. Each Australian State has constitution and a government which is responsible for portfolios including education, health, police, water supply, conservation and the environment, sport and recreation, consumer affairs, prisons, transport, main roads, railways, ports, housing, planning, development and emergency services. NSW State Parliament meets in Parliament House, Sydney and the leader of the NSW Government is the Premier. The State of NSW is divided into local government areas (sometimes called municipalities) which are governed by individual authorities, known as councils or shires which are made up of a group of suburbs, a town or a rural area. There are 152 local councils in NSW providing services and facilities to their local communities. Their powers are outlined by the Local Government Act 1993 which sets out their responsibilities and how they can operate. Councils and shires administer Acts of Parliament enacted by the federal and state governments at a local level and they have the power to pass their own by-laws. The Council of the City of Sydney comprises a popularly elected lord mayor and 9 democratically elected councillors. How did local government develop? Long before the arrival of Europeans, the Australian Aboriginal people had their own form of local government whereby elders made decisions on behalf of their tribes. Following the arrival of Europeans, a formal system of local government was established first, followed by state and federal government. Adelaide was the first city to elect a council, followed by Sydney and Melbourne (then part of New South Wales) in 1842. Local government as we know it today developed from reforms to the feudal management of towns, cities and regional areas in England, following the passing of the Municipal Corporations Act In 1835. Seven years later, the Parliament in England passed an Act of Parliament which declared the settlement of Sydney to be a ‘town’. (NSW did not achieve responsible government until 1856 so until then our laws were made in England) To administer this Act, it was necessary to establish a council (or corporation as it was called then) of people elected by ratepayers to represent their interests. The council was made up of elected councillors and aldermen who represented different parts of the town which were divided into wards. Council was required to appoint a salaried town clerk and treasurer to manage its business and all financial accounts and transactions were liable to an annual audit. It became the authority administering the police and took on responsibility for roads, drainage, public health and social improvement. Today, the terms and conditions of how councils are structured, when they meet, how often elections are called, how they can collect rates and what they can do with the income is outlined in the Local Government Act 1993. The lord mayor (or mayor) of a council is elected as a representative of a local government area at a general election held every four years (or is chosen by members of council after an election as the chairperson). Councils appoint a general manager or chief executive officer (formerly a town clerk) to carry out their decisions and manage the administrative staff who provide advice to council and implement council policies and decisions. To do this, council staff prepare reports, investigate the legal responsibilities and inform and consult with the community. Councils also employ staff who work as administration officers, librarians, plant and equipment operators, planners, inspectors, engineers, community workers, environmental officers, horticulture workers and recreation officers. The mayoral office carries with it responsibilities including running and chairing the meetings of council, acting as the spokesperson of the council at community events or in the media, carrying out civic duties such as citizenship ceremonies and working with the chief executive officer on council business. More information about how decisions are made can be accessed by clicking here. What does your Council do for you? It’s the weekend and you and your friends have been enjoying an afternoon at the beach, swimming in the ocean pool and hanging out in the skate park. You walk home along the footpath to your house, at 53 Brown Street, the one with the big street tree in the nature strip, next to the oval. Tomorrow you have a school project to finish so you are planning to visit the library to use the internet and borrow some books and cds. If you finish early, there might be time to take your dog for a walk in the local park, climb the rope ladder in the playground and be home before the street-lights come on but in time to take the garbage and recycling out. Every item underlined above is a service or facility which your local provides. represent the needs and desires of local communities to other governments and other organisations. Councils are required by law to provide planning and development services; building regulations; environmental health; and dog and cat management. They also manage the roads and footpaths in their area, stormwater drainage, street lighting, traffic management and parking, rubbish and recycling, sport, recreational and cultural facilities, cemeteries, community services, festivals and events and local museums and libraries. Council raises funds by charging landowners a tax which is based on the value of their land. Different rates apply for owners of domestic properties and for industrial or commercial sites. Charges are also levied for parking, for the use of amenities (pools, hall hire, parking); fees (building applications, dog licences); or concessions (cafes at recreational centres) or services (child care). Local government is also eligible for grants and/or loans for specific major projects. Where does the Council of the City of Sydney meet? The elected representatives of the Council of the City of Sydney meet in Sydney Town Hall where their debates and discussions are open to the public. The Council of the City of Sydney is required to hold ten meetings per year, each in a different month in the Council Chamber in Sydney Town Hall, where they have met since 1884. Why is a town hall important to a community? Town halls are important civic places where communities can gather for a wide variety of political, social, and cultural activities. They generally comprise meeting rooms, civic offices and a multipurpose hall which is available for public hire. Some town halls are surrounded by public open spaces or civic plazas. 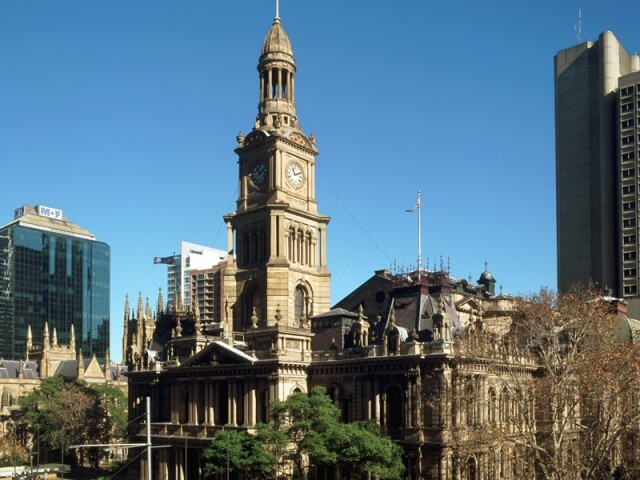 Town halls are often important architectural buildings in their local areas and many, like Sydney Town Hall, have heritage significance to the community.